How do I remove the alternator from engine compartment on 2007 Shelby gt 500. Alternator is loose but can't seem to get it out from above or below due to no space. All bolts are loose. I just don't have any room from the top or bottom! There are three main tasks you need to do to complete a 2007 Shelby GT500 alternator removal, plus a number of other smaller ones. It sounds like you have done most of the hard work, but you may be missing one of the steps, so I'm going to list the complete removal and installation procedure for your 5.4 liter Shelby V8 engine. Oh. By the way, Ford recommends discarding and replacing the 4 stabilizer bar nuts (part no. W520213). 2. Rotate your drive belt tensioner head clockwise to loosen the belt and then move the belt out of the way. 3. Remove the two upper generator bolts. 4. Next remove the power steering tube bracket nut and move the bracket to the side. 5. Remove and discard the 4 stabilizer bracket nuts and remove the brackets. 6. Move the sway bar (stabilizer bar) aside. 7. Remove the electrical connector for the alternator (Ford calls it a generator). 8. 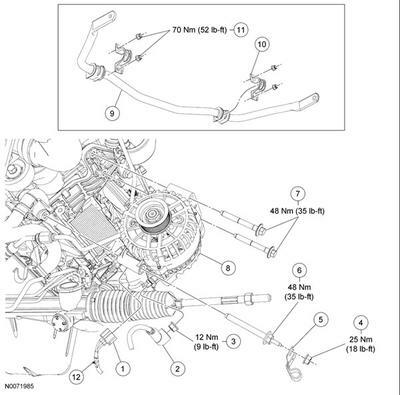 Remove the pushpin from the back of the alternator and set the harness out of the way. 9. Loosen and remove the alternator's B+ connection, nut and boot. 10. Remove the lower alternator bolt and pull out the alternator. My guess would be that you didn't remove the sway bar, as most of us would assume that would not be necessary. Upper alternator bolts torqued to 35 lb-ft.
Power steering tube bracket nuts to 18 lb-ft.
New stabilizer bracket nuts torque to 52 lb-ft.
Alternator (generator) B+ nut to 9 lb-ft.
Lower generator bolt/nut torque is 35 lb-ft.
Good luck on your Shelby's Alternator Removal and replacement.